Westfield House Farm is nestled in beautiful Upper Coquetdale in the heart of the Northumbrian countryside and within a couple of miles from Northumberland National Park. Its idyllic setting offers a seclusion that is hard to find – even in England’s most sparsely populated county. The farm is located at the end of it’s own private road and, as part of Natural England’s Higher Level Stewardship Scheme, is managed to enhance wildlife and biodiversity. The farm includes it’s own working hay meadow and designated Sight of Special Scientific Interest (SSSI) where wildlife of all kinds are abundant. 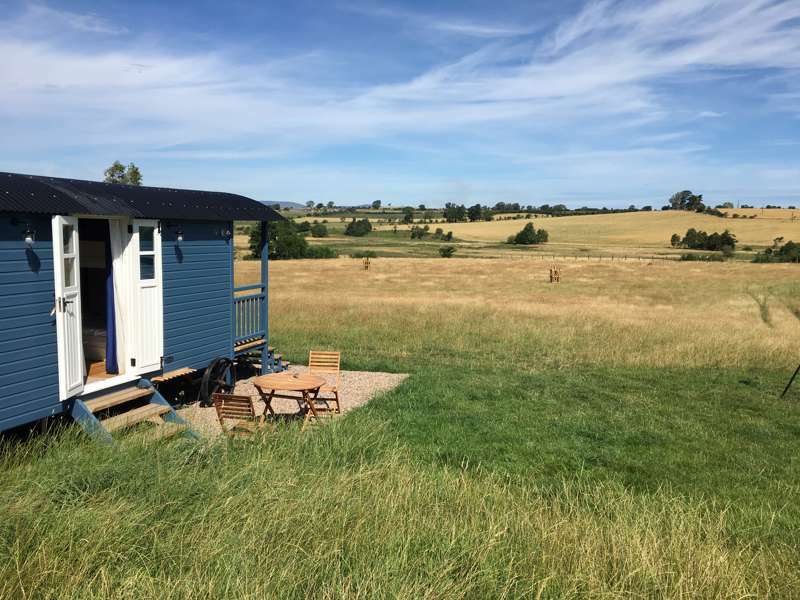 Set away from the house next to the farm's SSSI are Leveret and Demoiselle, the first two of our luxury, en-suite shepherd's huts. All huts have their own en suite loo and shower, kitchen facilities, wood burning stove and electricity supply. 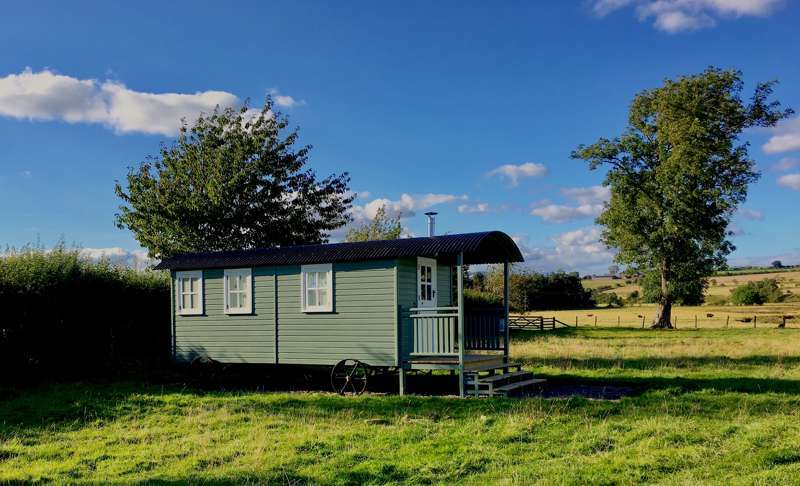 The shepherd’s huts and B&B are run by Tim & Emma, with a little help from their three young daughters - we really look forward to welcoming you. For latest availability and best prices for Westfield House Farm, please use the Date Search above. 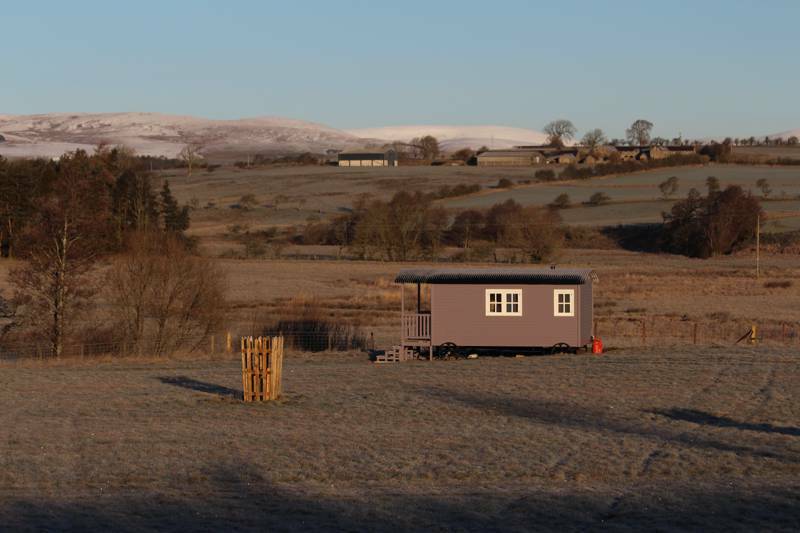 All huts are fully en suite (shower and loo), have electricity and a wood burning stove. The in-hut kitchen features a Belfast sink, 4-ring gas hobs, an oven, storage and all the crockery, cutlery and utensils you'll need. Leveret has a full-sized double bed, while Demoiselle, also has a full double, plus an additional bunk bed for 2 children. Outdoor furniture and campfire tripods provided. The whole farm is part of Natural England’s Higher Level Stewardship Scheme and includes it’s own Site of Special Scientific Interest and working hay meadow. Lambs in the surrounding meadows from late March–late May. There are a number of good walks direct from the front door of the huts, which offer some great views over Coquetdale, the Wreigh Burn and River Coquet. It's 3 miles to Cragside (01669 620333), a Victorian country house that was once home to quirky inventor and scientist William Armstrong. It was the first house in the world to be lit using hydroelectric power, with Armstrong building dams and creating lakes on the estate to power a sawmill, a water-powered laundry, early versions of a dishwasher and even a hydroelectric rotisserie. Now looked after by the National Trust, it's an intriguing day out for all ages. On the edge of Northumberland National Park, Westfield House Farm offers some superb hiking, mountain biking and wild swimming. Further afield, but still an easy drive away, are the Northumberland Coast AONB, Alnwick and Hadrian’s Wall. Rothbury offers some great local independent shops including a butcher, deli, 2 bakeries and Tully’s (01669 620574), an independent food shop where you can pick up some Craster kippers. Bread from Rothbury’s Greenwell Bakery (01669 620546), free range eggs and bacon from local butcher are provided in the huts. The Three Wheat Heads in Thropton (01669 620262) is the nearest pub and offers a large menu and easy dining. The Narrow Nick in Rothbury (07707 703182) is a great little micro pub offering craft beers and a variety of gins. If you're heading further afield, Mizen Head in Bamburgh (01668 214254) is fantastic for seafood, as is The Old Boathouse in Amble (01665 711232), with a top location right by the harbour. The Pack Horse Inn in Ellingham (01665 589 292) has the best beer garden, while Nadon Thai in Morpeth (01670 458151) win's our award for the best hidden gem – despite its unassuming location above a chippy, this small Thai restaurant is exceptional (take-away also available). If approaching from the east, drive straight through Rothbury then a couple of miles along the B6341 on to Thropton. Drive through Thropton and Westfield House Farm is the first turn on your right, no more than 1 mile outside Thropton Village. You will see a Westfield House Farm sign on the verge. The easiest way to travel to Westfield House Farm is by car, however there are (limited) public transport options. The nearest train stations are at Alnmouth and Morpeth (both about 19 miles away and on the main east coast main line). Thropton (a mile from the front door) has hourly buses throughout the day to and from Newcastle and Morpeth. The journey time is about 45 minutes to/from Morpeth and 1 hour 20 to/from Newcastle. 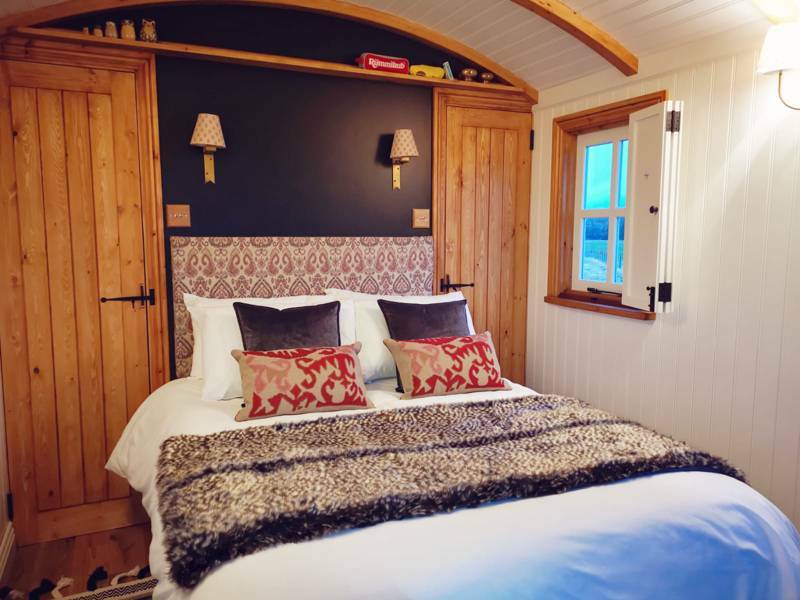 2 luxury shepherd's hut: Leveret (for couples) and Demoiselle (2 adults and 2 children).